Posted May 9, 2018 by Diane & filed under Events and Appearances. Bookstores have always meant a lot to me. I grew up in rural Maine (yes, Mount Desert Island is quite rural, especially in the winter), and I was lucky to have an indie nearby: Sherman’s Books of Bar Harbor. I remember walking up the wooden step into the shop and spending a good hour in the stacks. When I began writing seriously at age 14, my parents told me that they wanted me to amass a library of books that would help me become a writer, and so they bought me books, a few every month, up to a certain price. I indeed amassed a library (many Penguin classics in there!) that were to serve me well throughout the years. These days, bookstores have a new meaning for me. I still love to explore the stacks and pick up a book or two to add my current library (or my son’s). But they’re also places where I see my own book, and experience the quiet thrill of my protagonist looking at me from the cover. I’ve been fortunate to get to know the enthusiastic, eager readers who are bookstore staff, people who have kindly included my book in the stream of fiction they champion to their customers. One of my favorite bookstores in Maine is Bangor’s The Briar Patch. It’s a tightly packed indie with a great staff and a wonderful selection of past and current favorites, children’s books from picture books all the way up to young adult. They’re also in the process of expanding with an adult wing. I love exploring this bookstore, and I wish I lived closer. I was delighted when owner Gibran Graham asked if I’d visit for Independent Bookstore Day this year. 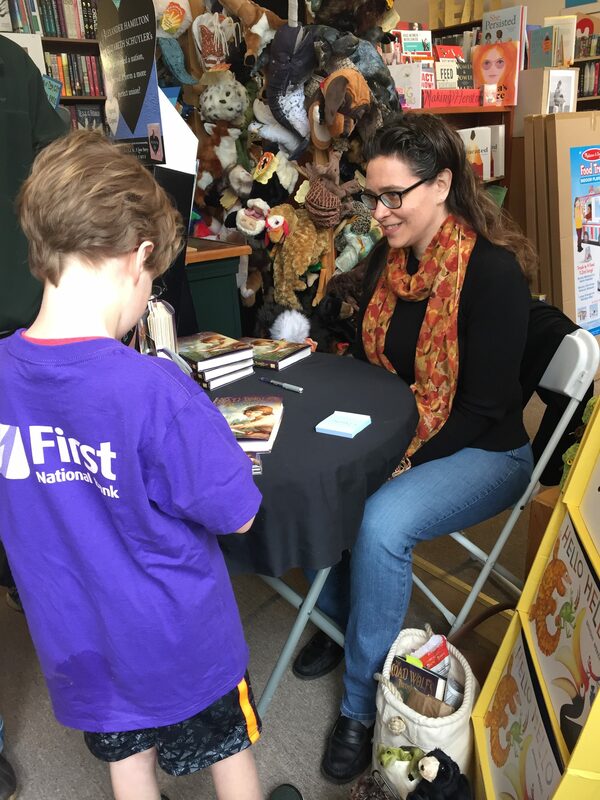 On April 28, I sat at my table, chatted with customers, read a few chapters, and signed a lot of copies of The Mad Wolf’s Daughter. Here I am, in action.